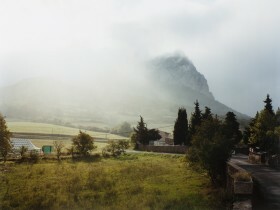 Yvette Monahan is a Dublin based Photographer who works with myths and landscape. She is interested in how a particular landscape can hold stories of what’s been and what could be. Her body of work The Time of Dreaming the World Awake won the Portfolio Award at PhotoIreland 2013. This body of work was also chosen to represent the Belfast Photo Festival at the Circulations Festival in Paris in February 2014. The book dummy of The Time of Dreaming the World Awake was nominated in January 2014 for MACK publishing’s First Book Award by Christiane Monarchi of Photomonitor. Yvette completed an MFA at the University of Ulster in 2013 under Paul Seawright and Donovan Wylie. Yvette also works as one half of seanandyvette photography with her husband Sean Breithaupt. They both work independently but come together for commissions.